Our city was hit by an early snowstorm this week. Overnight, we received about 7 inches of the white fluffies, and they were still coming down the following morning. Walking into the kitchen for my first cup of tea, I noticed the feeder was surrounded by snow, which meant that the little birds couldn't get to the food. 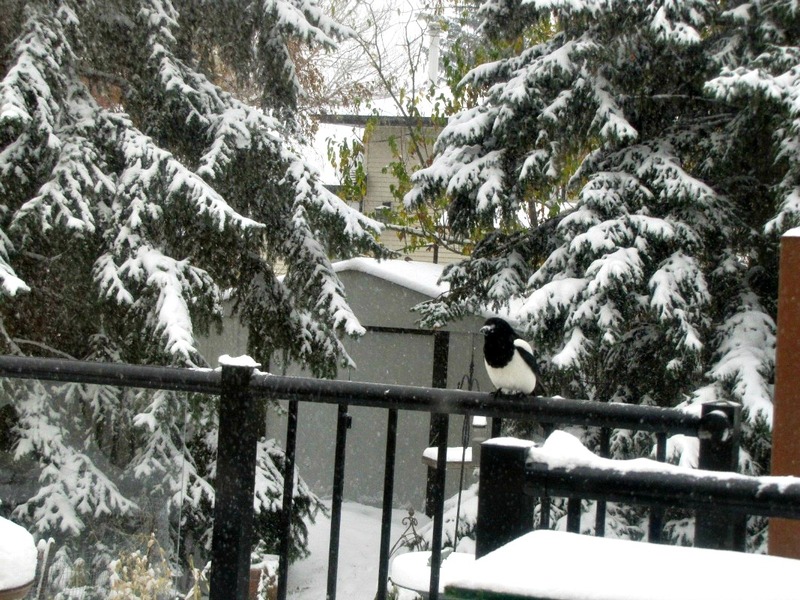 I was just about to go out and clear it away, when a large black and white bird quietly settled on the deck railing. Ah, yes, I thought. I'm being summoned. Again. Many, many years ago after a large overnight snowfall, I scattered two cups of dry dogfood out on the deck for the Black-billed Magpies. There were eight of them that time, and the food quickly disappeared. When it was gone, they left as quietly as they appeared. That original deck feeding was so long ago I can't even date it. 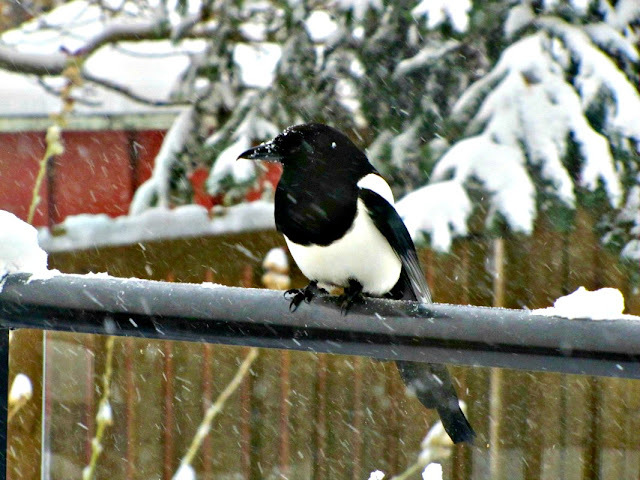 Yet each winter without fail, when we have a sudden large snowfall the magpies return. The routine never varies. It starts with one bird, sitting patiently, quietly, knowing it will soon be fed. As instructed on this blustery day, I duly put two cups of dry dogfood on the patio table, ducking back inside quickly. As soon as I got back in I picked up my camera, and took a picture of the feeding bird. I'm surprised he bothered to fly off the deck railing at all, as he certainly didn't hesitate to start eating. Soon this single bird was joined by a couple of family members, an assumption on my part as there is always a size difference, and a clear pecking order. Initially only one bird is allowed to feed at a time, immediately leaving the table when another flies in. Food consumption goes from one piece at a time to all they can grab in their beaks. Eventually the rules are relaxed a bit, and two can feed at the same time. It never takes long before more birds fly in and patiently wait their turn at the dinner table. They don't wait for the feeding bird to depart though. They seem to sit there until their patience just evaporates, and jump down on the table. With a great flapping of feathers, places are exchanged. By the time my bird count up made it up to four the food had almost disappeared. Next time I’ll put out 4 cups. The lifespan of a black-billed magpie is said to be five years. During those five years, my birds have clearly taught their youngsters what to do when a lot of snow suddenly appears. I suspect I am feeding generation upon generation of magpies that have learned this behaviour from their parents. Even if you aren't familiar with Black-billed Magpies, think of crows or jays. Quiet is not generally a word used in any description of them. Yet these birds never make a sound. More and more magpies quietly float without any vocalizations to advertise the fact they've found food. It's eerie corvid behaviour. This snowfall ended later that same day, and I haven’t had magpies on the deck since. What kind of bird doesn't come back every day for a handout? Clearly the self-sufficient magpies can get along just fine without relying on those pesky humans, but on days when their natural food is hidden, they have been taught exactly where to go for emergency supplies. Every time this happens I am amazed and humbled anew by the cleverness of corvids. Fascinating info, Pat! Corvids are so smart, and apparently they respect their elders! Great shots. I love corvids Pat so I was very happy to see you do this post on Black-billed Magpies. It would be eerie behavior to see them feeding this way while being silent, they are normally such chatterboxes! Thanks for this fun post. I enjoyed reading it. The snow & magpies are beautiful. Muy interesante eso que cuentas. Las urracas (en mi región las llamamos "pegas") son muy inteligentes y capaces de aprender tal como has comprobado. Buenas fotos. Enhorabuena. I found this post quite fascinating and interesting. I bet you look forward to the first snowfall every year. Smart birds, terrific post! What a neat post, Pat! And how amazing to have these large colorful birds in your yard.